Resident Foodies say: We ventured out to Left Coast, a cute cafe that specializes in organic, locally sourced food, juices, and smoothies. 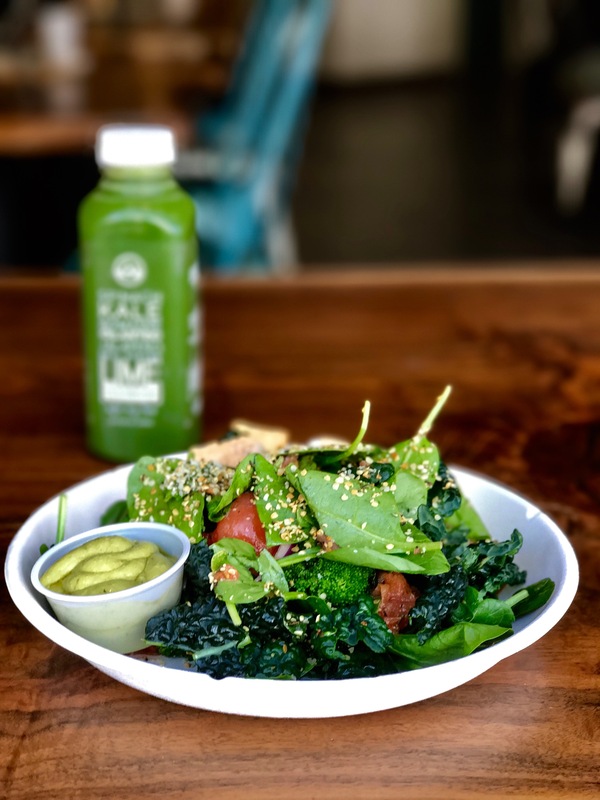 Today, we tried the Robust Rosa salad, consisting of kale, spinach, roasted broccoli, red onion, roasted tomato, toasted hemp seeds, avocado caesar dressing. It was fresh, healthy, and very tasty. We also tried the Light My Fire cold pressed juice (kale, spinach, romaine, cilantro, jalapeño, bell pepper, lime, sea salt) and the Fairways and Greens smoothie (spinach, apple, banana, avocado, spirulina, matcha tea, agave, lemon juice). Both were creative combinations, perfect for those who love veggie juice. Resident Foodies say: To celebrate President’s Day, we treated ourselves to brunch at our favorite neighborhood breakfast place, Esencia Urban Kitchen. 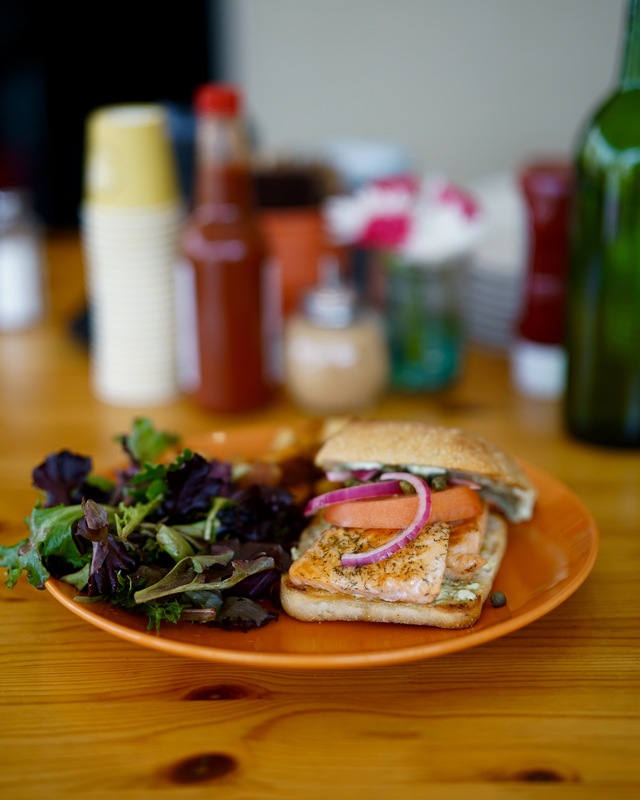 Today, we had the salmon sandwich, made with salmon, jalapeno spread, red onions, tomatoes, capers, ciabatta bread. The combination is oh so tasty. Yum yum. 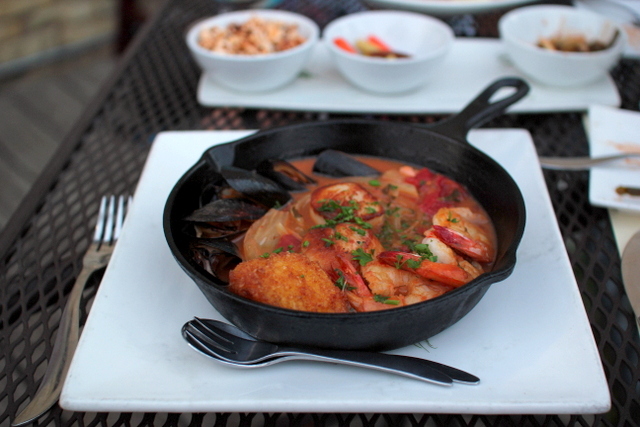 Resident Foodies say: We went back to Esencia Urban Kitchen on this amazing spring-like day. We tried the pesto chicken grilled cheese sandwich. It’s delicious. 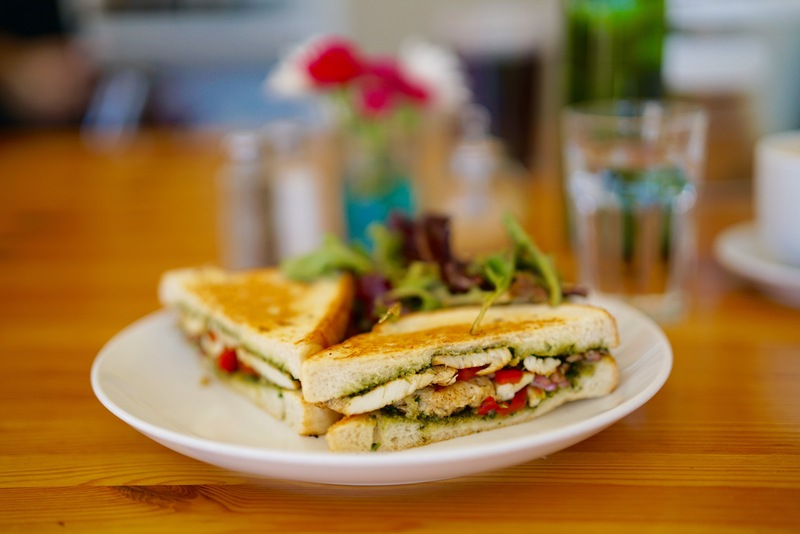 Grilled chicken breast, house pesto, red peppers, red onions, white cheddar on sourdough, what more can you ask for? 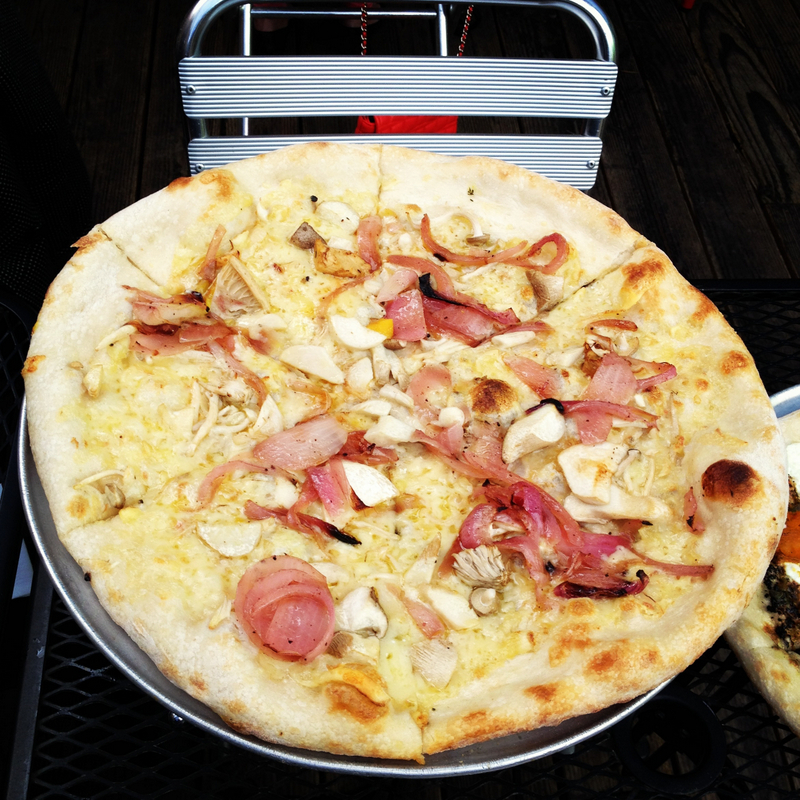 Resident Foodies say: Continuing our post on Starbelly in the Castro, the second pizza we had was the pizza with market mushrooms, cave aged gruyère, thyme & roasted onions. The butternut squash pizza really wowed us (click here for the review), but the mushroom pizza was a nice complement to our meal. 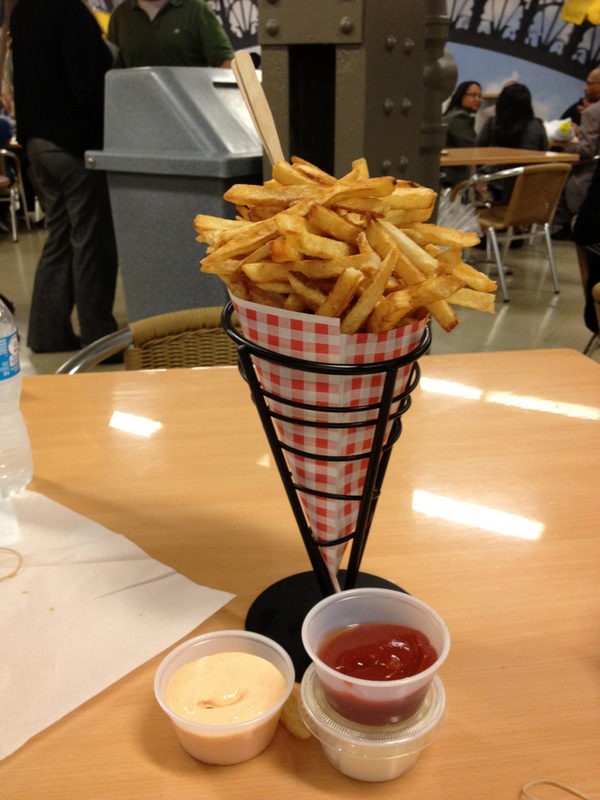 Resident Foodies say: We tried these excellent Belgian Fries with three dipping sauces at the French Market in the Ogilvie train station. Served in a wire basket resembling an ice cream cone of fries, these fries are thick, but not too thick, and prepared for each order. They take a while to prepare, but they are well worth the wait. Resident Foodies say: Roots is a family owned restaurant in Milwaukee, opened by Chef John Raymond in 2004. Roots is in the local (farm to table) movement and has its own garden right down below its patio, which supplies much of the vegetables for the dishes. Last December, Roots hired a new executive chef, Daniel Jacobs, who worked at a number of excellent Chicago restaurants, including Green Zebra, Spring, Tru, and North Pond. The current menu is fun and eclectic, with a fusion of various cuisines including Asian, Italian, and American.
. All were perfectly cooked, and the broth tasted like nectar from the gods. 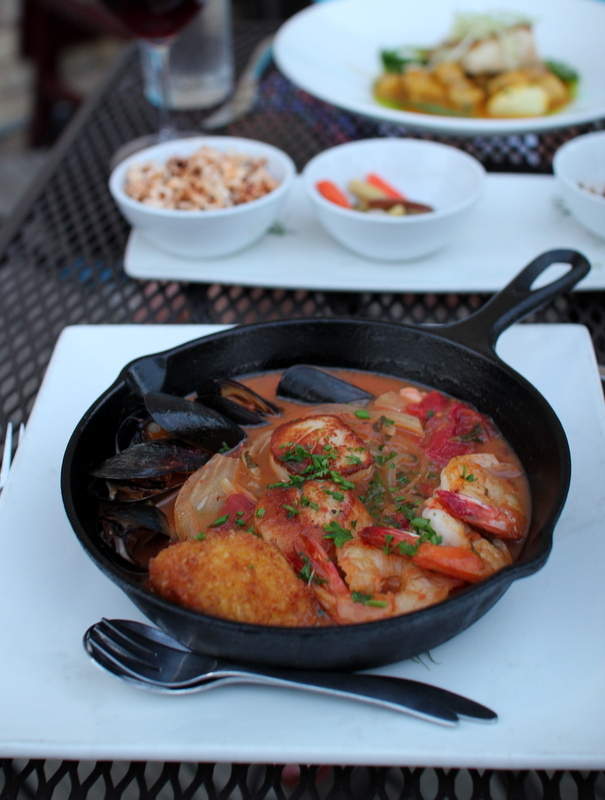 We especially loved the vivid red-orange color of the stew, especially in the cast iron skillet.